As a proud supplier of Miele vacuum cleaners Danvers MA area residents can count on North Shore Vacuum and Appliance for experience and quality. We are determined to provide our customers the best in top-of-the-line standards which includes Miele vacuum cleaners, among other brands and appliances. Since 1934, we have provided the utmost in customer service and product knowledge to our customers, as well as providing expert repair services. 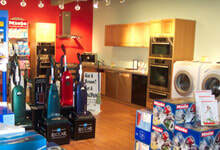 Recently, we have added to that reputation by offering Miele vacuum cleaners and appliances. Recognized as a Miele Diamond Dealer, our store is now among the highest received in the industry when it comes to service and consumer satisfaction surrounding Miele vacuum cleaners. Whatever questions you may have about Miele vacuum cleaners, our experts are here to answer them. Reach us by phone at (978) 774-1155 or on email at wsims@msn.com. Or stop by today. Our store is open six days a week for your convenience, Monday-Saturday from 9 a.m. to 6 p.m. Why should you choose from Miele vacuum cleaners Danvers MA? Area residents can find out here.